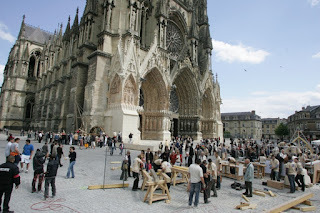 The Reims Cathedral celebration began May 6 and lasts until October 23, 2011. Numerous concerts, street performances, exhibitions, and conferences, as well as an extraordinary illumination of the cathedral are all planned for the City of Coronations. The event celebrates a symbolic monument for the Champagne region and the history of France - a building renowned all over the world over for its magnificent architecture and the splendour of its statuary. Location of the coronation of the kings of France (twenty-nine kings of France were crowned in Reims between 1027 and 1825), the cathedral acquired for the contemporary world a European destiny after the Franco-German reconciliation formalized in its vaults by Charles de Gaulle and Konrad Adenauer in July 1962. 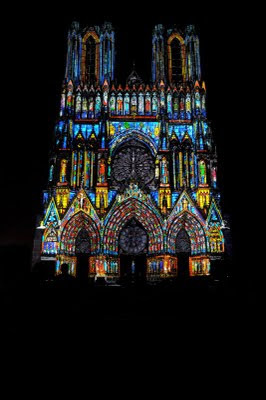 Notre-Dame de Reims also plays a key role in the history of art: a jewel of Gothic architecture, the cathedral, which acts as a global reference, has been a listed UNESCO World Heritage Site since December 1991. The year 2011 honors the builders of yesterday and today. Wines from the Champagne region were historically served at the royal banquets that accompanied coronations, contributing to Champagne's reputation as a luxurious beverage. "The Reims Cathedral is a stunning showcase of the Champagne region's history and beauty," said Sam Heitner, director of the Champagne Bureau, the U.S. representative of the Comit Interprofessionnel du Vin de Champagne CIVC.